There are caves and there are caves. Many of them were discovered long ago, and the easily accessible ones suffered grievous damage. 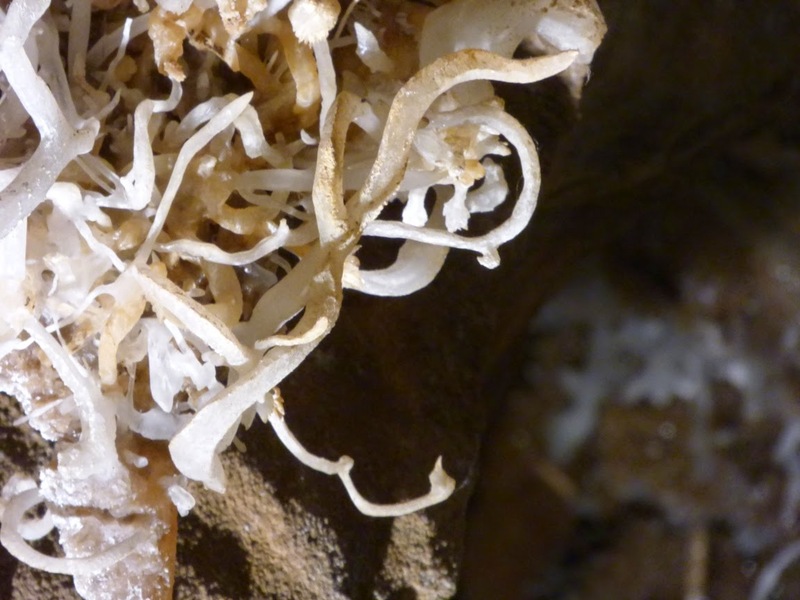 In earlier days, cave decorations (speleothems) were broken off as souvenirs in the sadly mistaken belief that they would grow back quickly. Today's cave vandals have no such excuse. They break and destroy for sheer maliciousness. It's sad either way because caves don't recover, not in any kind of human time-frame. Their special kind of beauty is lost to us. That's what makes a few caves extra precious. 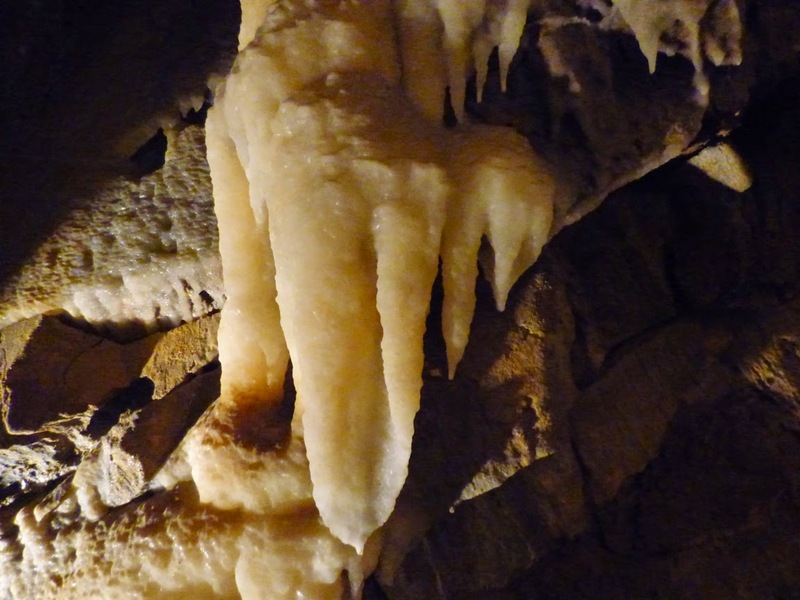 A few weeks ago, I explored Crystal Cave in Sequoia, which by virtue of being in a national park and being discovered by park personnel, was protected before catastrophic damage was done. It was developed for tourism, and millions of people have walked its passageways and yet it was protected by and large from the worst abuses. The tour I was on yesterday was a different circumstance. 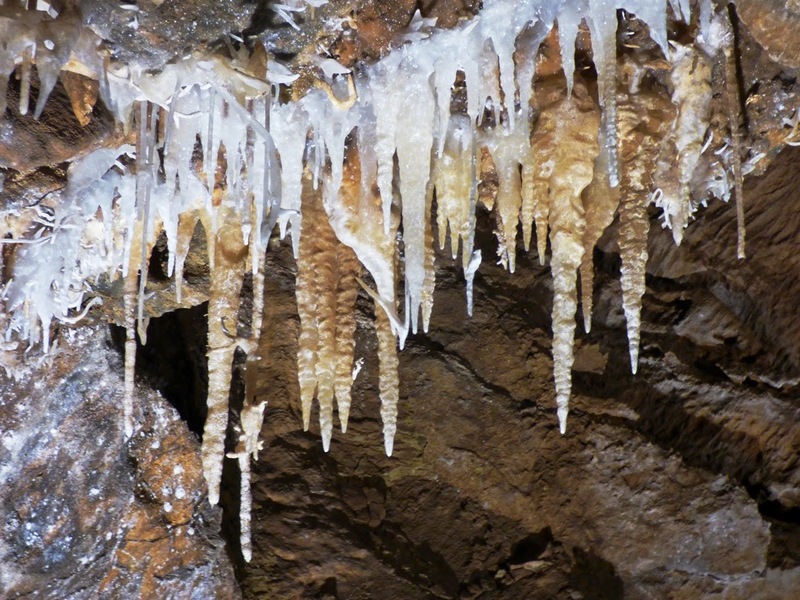 Black Chasm cave near the Gold Rush town of Volcano in the Sierra Nevada Mother Lode is a privately owned cavern. It was discovered in the 1800s but the "chasm", a ninety foot deep crevice, prevented the miners from ever getting into the remote reaches of the cave. Access required technical climbing skills, and people who go through that much trouble rarely have vandalism in mind. 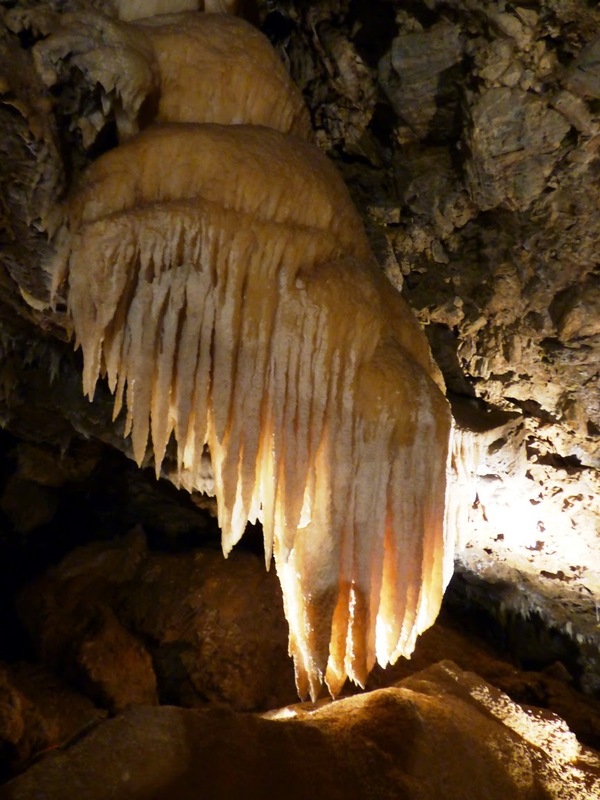 A decision was reached in the 1990s to develop the cave for tourism, making a total of six such caves in the Sierra Nevada: Crystal Cave, Boyden Cavern, Mercer Caverns, Moaning Cavern, California Cavern, and Black Chasm. A stairwell and boardwalk were pinned to the edge of the chasm, allowing for access to the nicely decorated room beyond. A room never despoiled by vandals, or dirtied by sooty lanterns and torches. 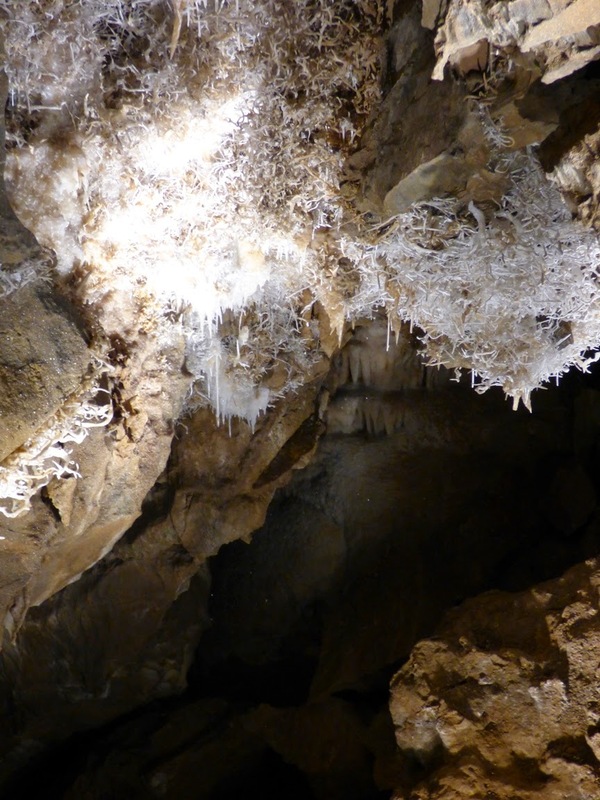 For those who have only seen the usual soiled yellow-brown stalactites and stalagmites, the pearly white formations are a revelation about what a cave can look like. Beautiful examples festoon the walls. But Black Chasm has an additional feature that is astounding. Stalactites on LSD! 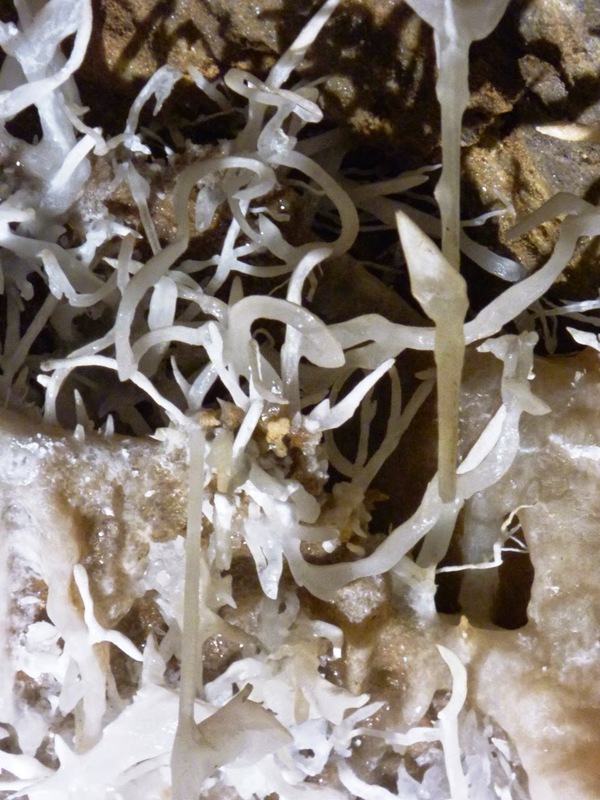 Growing out of the walls at odd angles, and growing in totally random orientations, helictites are strange and rare cave formations. 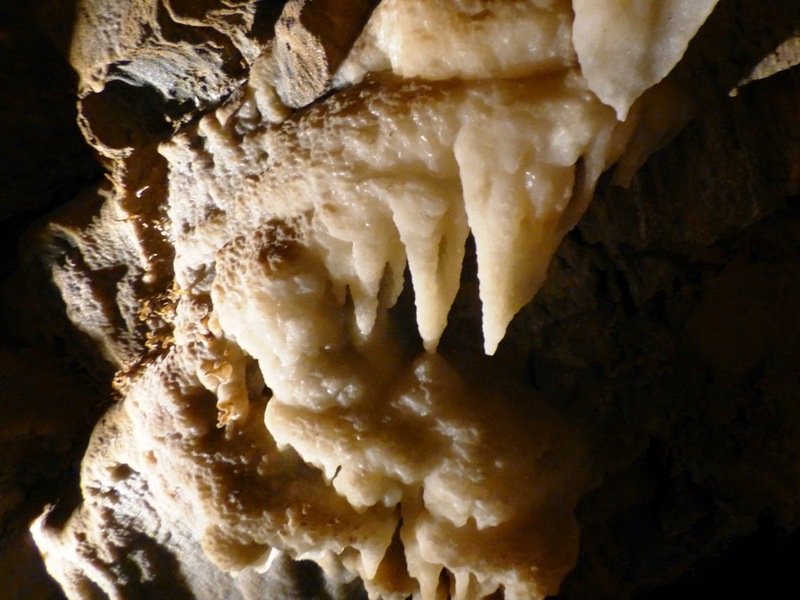 They are easily broken off, and are undoubtedly one of the first formations to disappear from caves. They are present in Black Chasm in, shall we say, large numbers. Really large numbers, enough that the cavern was granted National Natural Landmark status, a federal designation that recognizes the value of natural features on private lands, including agreements to protect the resource. The exact process by which helictites form is not clearly known. 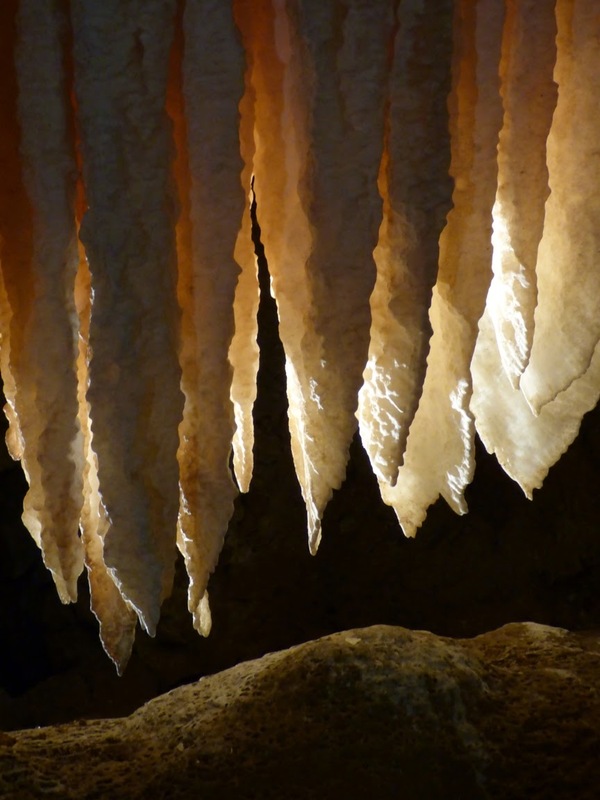 They are most likely related to capillary action of water squeezing out of microscopic openings in small stalactites and precipitating small amounts of calcite. Because water under pressure can be squeezed upwards, the development of the helictites is not governed by gravity. 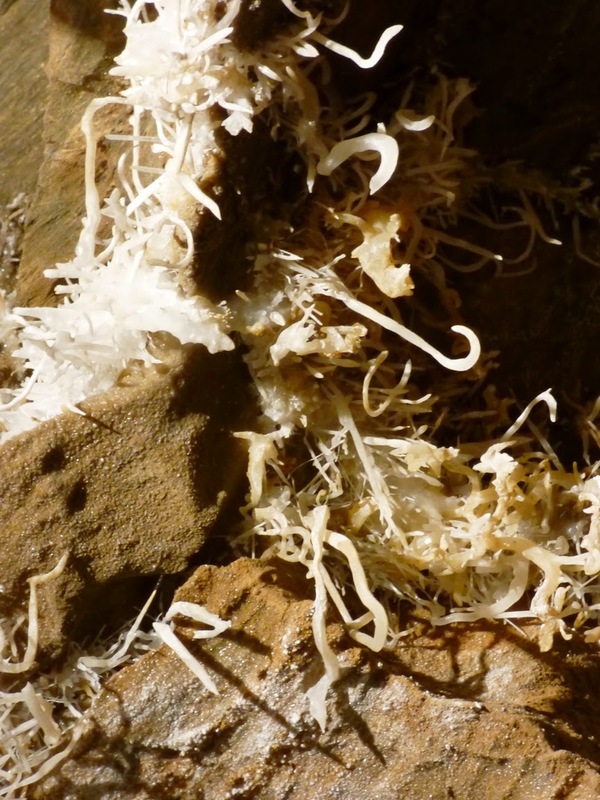 The number and variety of helictites in the Landmark Room of Black Chasm is simply stunning. I haven't been to every cave in the world, but I would not be surprised if these are some of finest examples in existence (although I am always open to correction on such issues). Black Chasm Cave, as noted before, is a privately owned business. They are there to make a profit, but they have done a good job of protecting their cave, and I recommend a visit. They offer discounts for educational groups (they can accommodate up to 22 people at a time, so large classes would need to split into two tours). More information about the cave can be found here. Tell them Geotripper sent you!